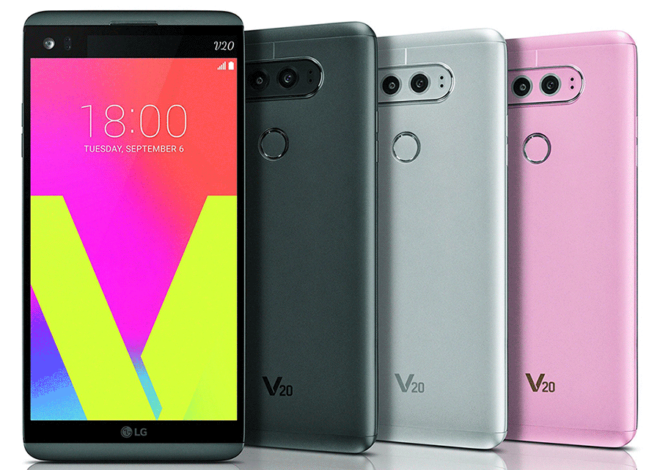 UPDATE: T-Mobile has confirmed that it will offer the LG V20 this fall. Expect more details as we get closer to launch. We’re in the thick of flagship smartphone season once again, and today it’s LG’s turn to show off its latest offering, the V20. The LG V20 is now official, and like the V10 before it, it’s got a secondary display sitting above its main screen. This secondary display has a resolution of 160×1040. Meanwhile, the main screen is a 5.7-inch 2560×1440 panel. You can use this secondary display for app shortcuts or to expand notifications, letting you read more of a longer message. One notable difference between the V10 and the V20 are the camera setups. While the LG V10 boasted two front cameras and a single rear, the LG V20 has two rear cameras and one front. Specifically, the V20 is packing 16-megapixel standard lens and then an 8-megapixel wide-angle lens next to it, with a fingerprint reader below them. These cameras have what LG calls a Hybrid Auto Focus, which combines laser autofocus, phase detection autofocus, and contrast autofocus. Also offered on the rear cameras is Steady Record 2.0, which uses electronic image stabilization to reduce shaking while you’re recording video. Around front there’s a 5-megapixel camera with wide-angle lens resting next to the V20’s secondary display. Another V20 feature that LG is touting is its Quad DAC (digital to analog converter). LG says that this feature will help the V20 to reduce distortion and ambient noise for higher-quality audio when used with compatible wired headphones. The LG V20’s other specs are about as high-end as you’d expect from a new Android flagship in late 2016. There’s a Snapdragon 820 processor, 4GB of RAM, 64GB of storage, and a microSD slot for adding even more storage. Powering this whole package is a 3,200mAh battery that you can remove by popping off the metal back of the device. You do that by pressing the button on the lower right side of the V20. Finally, LG touts that the V20 has passed the MIL-STD 810G Transit Drop Test, which lets it withstand drops from four feet up and still function normally. The LG V20 will come preloaded with Android 7.0 Nougat with LG UX 5.0+. It’ll be available in Titan, Silver, and Pink color options. The LG V20 will launch in Korea this month, followed by releases in other regions. T-Mobile hasn’t made any launch announcements as of this writing, but considering that T-Mo offered the V10 and that T-Mo’s own Des Smith was at the unveiling tonight, it wouldn’t be a surprise to learn that the V20 is T-Mobile-bound. LG’s new V20 looks like a nice flagship, offering all of the specs that you’d expect as well as a focus on multimedia, like the V10 before it. LG did switch some things up, though, like putting more of a focus on the V20’s rear camera setup and using a metal rear cover rather than a rubberized back like the one on the V10. Two features that LG kept from the V10, though, were a removable battery and microSD slot, which is sure to please a lot of folks. Now that it’s official, what do you think of the LG V20? JerryRigEverything completely revealed fraudulent marketing that LG tried to push their G5 as a metal-body when it was “mixed” with polycarbonate. Oh don’t forget the bootloops! what’s next, software failure? You must’ve not heard of numerous complaints detailing the horrible warranty processing for LG. Wait what is the point of the hashtag? I don’t think they work like you think they do here. Dealing with that right now on my G4. Been three months of sending the phone back and forth. LG repair is totally and completely incompetent. Wow phenomenal hardware. I think given the feature set it may be the top flagship thus far. All I care about is Pixel Season! meh…. I think am done with LG. It is larger than the Note 7 and still don’t have a use for the secondary display. Also I like a little less bezel. Not impressed with a 72.4% screen-to-body ratio on newer phones. Nice, finally a replaceable battery. Anyone know if there’s a wireless charging option? After all the 4000 mah leaks, Man that 3200 mah cell through me for a loop. I don’t get it.Note 7 has 3500 mah battery.Why lg v20 has 3200?Battery was the most important part and they failed at least to match note 7. Or you could get the Note 7 so you don’t have to carry a spare battery. Or your battery can blow up and there you go. And where would I buy a bigger battery? I have not seen any listed yet. I like all 3 LG styles: buttons on the back, modular and now back metal cover. I think a metal back cover with buttons on the back would be great. Water resistance should depend more on the type of cases we use. I like it BUT… 64gb not too future proof. Why thank you, Sir Guest! Gee, was I gone and feeling down? It has an SD card slot. How much more future proofing you need? I have unlimited tether, and the phone will hold all data / help do more and more field work / lighten the tablet and flash drive load. Want to rely on sd as least as possible. Anyway, whatever one can put on external needs a backup on internal & vice versa. @64 can’t hold everything for that long. It would if there were TWO SD slots…and insurance no matter what breaks / or if away from good signal. You do realize you can put in a 2TB that is Terabytes SD card in it right? LG….all i ask is for B&O Play in the US. Why can’t you get this deal done in the US? I contacted LG about the missing B&O “Friend” at the G5’s launch. There were going to “Get back” with me. I’ve heard that for whatever reason the B&O Module has not been approved by the FCC. I was thinking about having a friend in the U.K. score one for me. I like that the upgraded DAC is built in to the V20. I wonder if the v20 support tmobile 4×4 MIMO? The modem inside the phone has no bearing on 4×4 mimo. To have 4×4 mimo you need 4 antennas each for downlink and uplink. This is something phones are only just starting to do. It’s very difficult to put 4 antennas close together and have them work without interference or issues. LG has not announced if the phone has 4×4 mimo support yet from what I can tell, and the note 7 is the first phone to be able to support such a feature, though it’s thought the s7 and s7e should as well, no one knows for sure. i spoke with tmobile. they told me the s7/s7edge will be supported in my area in october. The small battery made this go from a rumored winner to another meh phone and LG can’t afford that right now. Which do you think is more important to the average customer a cool dac for downward facing speakers or a longer battery life? The speakers. With a removable battery you could upgrade yourself. There is no way you can upgrade he speakers…..
OK – then they failed on both. The downward facing speakers are positioned poorly. If you know about sound then you know it is directional unless you are talking about subwoofer frequencies. So you can either look at the screen to see what is on it or aim the bottom of the unit at your head for good sound but you can’t have good sound while looking at the screen. You can direct the sound to your ears with the palm of the hand that’s holding the phone. I’ll probably get this phone, mainly because of the replaceable battery. A little disappointed by 3200mah, but it can be changed if it starts overheating/failing. But, I’ll wait to see if it has any bootloop issues. Initial hands on said the build quality was much better than the v10. If they throw in a spare battery as a launch gift, I’ll be getting this phone. As long as they also through in a charger that could charge the spare battery without the phone, I agree. I’m just hoping LG has cleaned up their quality control issues. Boot loop, restarts and all the other crappy G4 stuff makes me hesitant. I don’t recall them mentioning any headphones that may or may not come with this. Did I miss anything? During the event they said preorders will get B&O H3 headphones. Thought not sure if that is up to the carrier or how it works exactly. Wish they had a white version, but ah well, silver or pink will do. Honestly, the front looks okay but the back’s kind of bland. I feel that it’s a step down from the V10 looks-wise. I feel like LG’s losing it when it comes to aesthetics nowadays. I hope they turn that around. The G4 and V10 were the last 2 phones from them I thought looked great. I’m surprised that nearly a year later (October 28, 2015) that the V10 still commands the same $599 price on T-Mobile. I’m wondering if T-Mobile will adjust the V10 price with the V20 introduction, or simply sell the V10 in parallel with the V20. 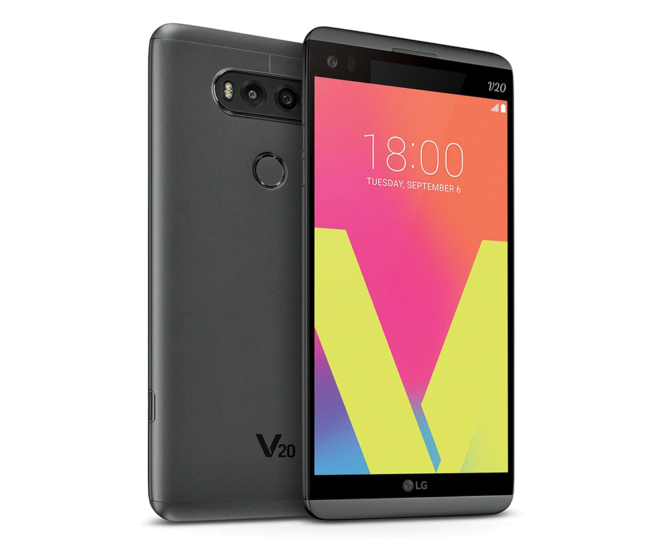 I would not be surprised that the V20 will have a $699 asking price to keep in in the premium side of the SGS Note 7.
tmo sells previous versions of apple and samsung still, and not much of a discount. it’s safe to assume this will be the case for the v10. i did notice they have dropped the price of the g5 to 499 this morning. G5 has been $500 for a few weeks now. I thought about upgrading my G4 to it, but paid $325 for it back in November 2015. Waiting till November 2016 for the price to hit the low $300s. the front reminds me of my g3 (not a bad thing). i’ll have to see it in-person to gauge the fit and finish. Does anyone think it will suport tmobiles new lte advanced ? Someone else on a other forum asked if the new iphone 7will support it on tmobile everyone told him no . i hope the tmobile version of the v20 will. any guesses on the color choices tmobile will offer? They disappointed with only selling the v10 in only black when it came in 5 colors.. I applaud LG for continuing to offer a user replaceable battery in their flagship phones. If Samsung had done the same, they wouldn’t need to issue a recall on the Galaxy Note 7. They could have just sent out new batteries. Yes, I am very interested in the LG V20. Any more word on if the pre-orders start tomo? The V10 does have a removable battery and SD Card capability. As a matter of fact the initial LG promo at the V10’s introduction was a spare battery and charging base. My question is “What is the ISO range on the V20?” The V10 topped out at 2700 which is substantial when comparing to other flagships like the Galaxy S7’s 800 ISO. Never owned an LG but looks cool. Why not just one larger screen instead of two though?